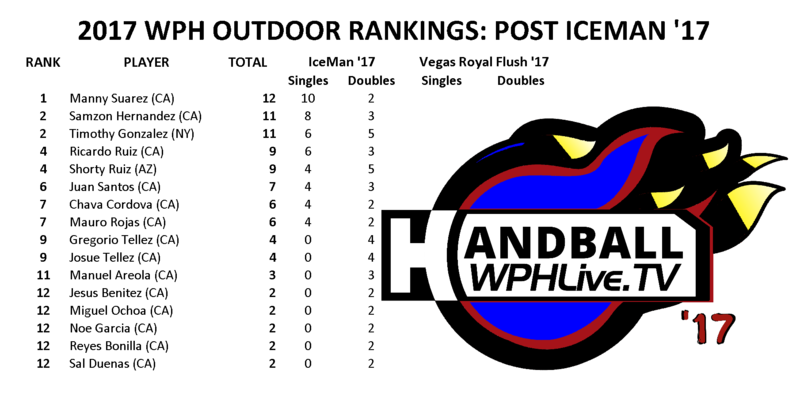 WPH Outdoor kicks off the 2017 Big Ball season with Cup Stop #1 in Stockton, CA, January 28th-29th, 2017. Manny Suarez gathers his first yellow for pulling down the singles crown; meanwhile, Timothy Gonzalez and Shorty Ruiz take home another first place trophy and much needed ranking points. 50 year old Gollo Tellez is back in the top ten, while Samzon Hernandez returns to a familiar area. Speaking of familiar areas, Ricardo Ruiz, makes a comeback with a splash defeating current Cup Stop Champion, Juan Santos, in the quarters and has moved into the top four alongside brother Shorty (Braulio).